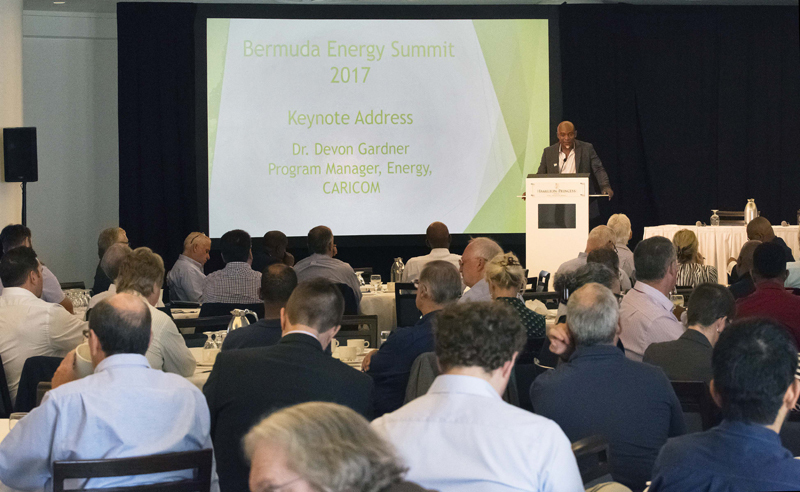 Deputy Premier and Minister of Transport and Regulatory Affairs Walter Roban has dubbed the Bermuda Energy Summit 2017 a success, after 140 delegates were told to look to the experience of other small jurisdictions in charting the island’s energy future. The event at the Hamilton Princess yesterday, included an Electric Vehicle Showcase on the Regency Terrace which featured a variety of cars and motorbikes powered by electricity. The Minister said, “While it is true that no one jurisdiction can be tied to the decisions of another, it is sometimes useful to understand the experience of other small countries, as we decide our own future. “A panel discussion exploring how the Integrated Resource Planning process is used in other jurisdictions, for example, points to useful options to consider in our efforts as we look ahead to the Regulatory Authority’s impending Integrated Resource Planning exercise. Guests included representatives from the Clinton Institute’s Islands Energy Program, WorldWatch Institute, Greenrock, the University of Illinois, the Regulatory Authority, the Brattle Group, and the Inter-American Development Bank, to name a few. 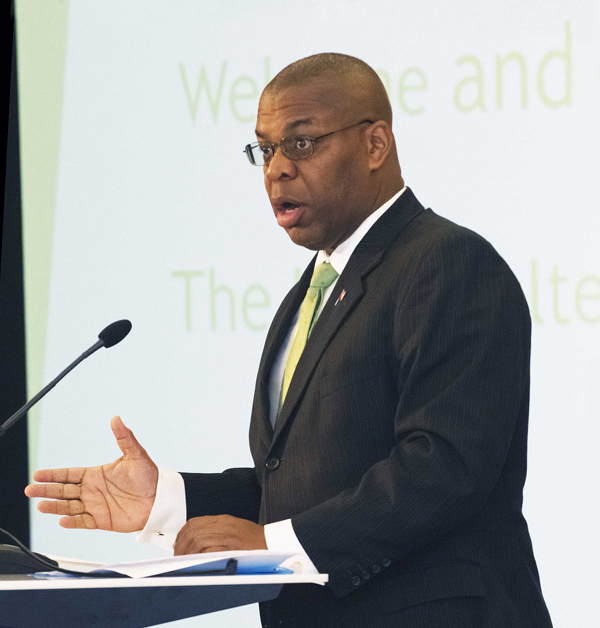 The Minister said that it was important that Bermuda gets it right, explores renewable energy sources that are right for Bermuda and provides the appropriate framework for regulation. The Summit explored several different aspects of the energy sector and included keynote speaker Dr. Devon Gardner, Program Manager, Energy of Caricom, with whom the hope is to have greater exchange and collaboration in the future to draw from the strengths of the Caribbean. Good morning and welcome, Premier Burt, Cabinet Colleagues, Members of Parliament, Distinguished Speakers, and guests. Today we are pleased to host the Third Annual Bermuda Energy Summit 2017- I say ‘Annual’, because there will always be matters around energy that need to be discussed. Since the previous Summit in June 2016, the Regulatory Authority, or RA, has commenced responsibility for the regulation of the electricity sector. Beginning in October last year, the RA has been working on developing the form and content of licenses, which will enable them to fully and properly regulate the sector. Some of you may be aware that licenses were issued to the Bermuda Electric Light Company [BELCO] for Bulk Generation and for Transmission, Distribution and Retail activities just a little over two weeks ago on October 27th . These licenses will eventually provide investor certainty in the sector, improving investment opportunities in energy in Bermuda. The theme underpinning this year’s Summit is the Integrated Resource Plan, or IRP, process. The next IRP will be initiated by the RA, and it will be the first time in Bermuda’s history that the IRP will be open to the public for meaningful comment and challenge. After licenses, this IRP is the next regulatory milestone before the RA for the energy sector. Historically, the IRP was the guide for the utility’s capital development. The IRP is defined as a comprehensive decision support tool and road map for meeting the company’s objective of providing reliable and least-cost electric service to all its customers, while addressing the substantial risks and uncertainties inherent in the electric utility business. Some of the risks we face include new challenges. The increasing incidence and probability of severe weather events, for example, change how we look at imported fuels. We cannot avoid events like hurricanes, rising tides, and the like, but what we can do is work toward ways to become more resilient in the face of these potential, increasingly likely, disasters. Our brothers and sisters in the Caribbean can attest to this need to be resilient and responsive, but unlike our southern cousins, we are isolated, and not near assistance, underscoring the need for us to become as self-sufficient as possible. Self-reliance will not happen with a status-quo approach toward our future. We must now look at IRPs differently. We must consider a multi-pronged approach to energy planning, where there are more participants than just the utility. For example, consumers could become ‘prosumers’- those who produce goods and services to the utility, as well as using electricity. Those goods and services include kilowatt-hours produced from distributed generation sources, and demand-side reduction or storage, for the re-deployment of load during times of peak use. Any new paradigm of energy planning going forward cannot happen overnight, nor can it happen without careful, inclusive and transparent planning. The IRPs of our future will require, according to the law, that the public is engaged to not only comment on the plan, but to challenge it where possible. This new way of charting our energy future will have to be done, again, according to law, before October 28th, 2018. This deadline is looming on our horizon. The goal of this Summit is to give the public some tools with which they can critically examine the IRP once it is initiated and to help all of us – BELCO, the RA, alternative energy investors, Government – to work collaboratively and positively as we progress Bermuda’s energy future. If done well, with full and dynamic engagement with the public, this IRP may well be the main investment guide for Bermuda’s energy sector for years to come. Today, we begin to prepare ourselves for this monumental and pioneering task.